CHASING FOOD DREAMS: Genji Japanese Restaurant, Hilton Petaling Jaya: Back to Basics with a Twist! Genji Japanese Restaurant, Hilton Petaling Jaya: Back to Basics with a Twist! It’s been at least 12 years since I was working in Petaling Jaya and use to patron Hilton Petaling Jaya Hotel for their restaurants. My company was just located right smack behind the hotel and we used to go for special occasions and business lunches and dinners at all their restaurants. Genji Japanese Restaurant was always a favorite. I remember Genji serving up quality and scrumptious Japanese dishes during those years. I admit to missing those warm and delicious memories. A recent invite to be back at Genji Japanese Restaurant evoked all those warm and delicious memories again. Walking into Genji, I immediately notice a new ambience filled with lots of natural wood, water, bamboo, and other classic Japanese elements. It was an exciting moment as I checked out a newer Genji from the one I last seen. One side of the restaurant is decorated with bamboo, wood and paper partitions and little man made ponds which leads to the private tatami dining rooms. 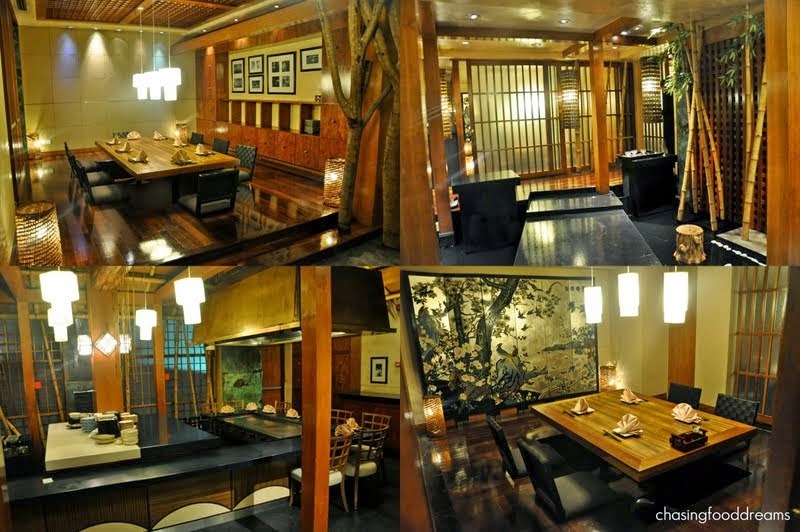 The other side offers the regular sit down table settings with a long sushi bar and an open teppanyaki counter. Genji Japanese Restaurant now boasts of a new fusion Japanese menu featuring a fusion of two of Japan’s biggest cities, Tokyo and Osaka. Themed with a ‘Back to Basics’ philosophy, Chef Richard Teoh and his culinary team is set to entice Japanese food lovers with a menu filled with authentic dishes injected with traditional artistry and modern bold flavours. It’s a fusion of mild and bold, rich and light, traditional and modern, all rooted in the origins of Tokyo and Osaka. We kicked off the back to basic culinary journey with a Trio of Appetizers. This course features mouthwatering tiny bites to set our palate in motion for what’s to come. Crunchy cucumber filled with little beads of beans and sesame seeds, a seashell of pickled jellyfish with Yamamomo and Tamago with radish are the trios featured that evening. The plate has got lots of different flavours and textures and each one is a little treat on its own. Yamamomo is a Japanese mountain berry and has a lovely underlying sweetness with hints of citrus notes. It’s my first time eating the berry and I really like it as it matches pretty well with the tangy and crunchy jelly fish. These appetizers will rotate depending on the availability of the day. Japanese salads are straight forward and tend to marry greens and seafood. Our Tokyo Salad with Wasabi Dressing is Chef Richard’s specialty where fresh mixed greens are perked up with crunchy seaweed, prawns, octopus and surf clams. Doused with a lightly creamy sesame dressing with light hints of wasabi, the salad is vibrant in flavours and textures. Nothing beats the truest form of Japanese cuisine, a Sashimi & Sushi Combo platter that showcase the freshest seafood at the restaurant. Our platter had an ice boat filled with thick pieces of fresh sashimi of salmon, tuna and Toro. These were just excellent and succulent with a light dipping of soy sauce and a smear of wasabi. The ice boat is a nice touch because it keeps the fish cold while we slowly savor it. Our assorted sushi had Chutoro, salmon, prawns, sea bream with Ikura and a big spider roll. I just love the sea bream with salmon roes. The fish is firm and sweet and the salmon roes add a salty luscious finish to the sushi. Let’s not forget the glorious melt-in-the-mouth Chutoro! Kaizen Mushi is mixed seafood cooked in an umami broth with vegetables. It’s a winter dish simply because the flavours are soothing and perfect to warm up the senses. The fish broth itself is made from bonito flakes and mackerel flakes according to Chef Richard. It has a well-rounded soft and umami flavour with light hint of yuzu aroma. Seafood like prawns, salmon, mussel is accompanied by greens and mushrooms. When savored, the seafood is sweet and light. A side sauce made from ponzu sauce, radish, tobacco and chili added another dimension of modernity to this dish as the flavours are strong and spicy. Almost too spicy for some people but since I love spicy flavours, the sauce livens up the dish. Gindara Teriyaki is cod beautifully glazed and broiled to perfection. The cod flesh is smooth, silky and sweet. The teriyaki glaze is deep and rich with tinges of caramelized notes. The fish sits on grated radish with blanched spinach and little Nameko mushrooms. As I slowly savored the fish, I never wanted the experience to end. The Kaki Chili Mayo is a perfect partner for the cod. Large US oyster is smothered in a luscious creamy chili mayonnaise made using bird eye chili before being broiled. The oyster is so plump and juicy. Its scrumptious with a spicy kick and dangerous because we all want more! Azuki Banana Dorayaki with Goma Ice Cream was a light and creamy ending to our meal that evening. Japanese pancake is rolled up with a sweet and nutty red bean paste and fresh banana. It’s easy to enjoy and the combination works pretty well. Although it’s nothing new, the black sesame ice cream is delicious and very aromatic. A piece of cantaloupe accompanies the duo for a refreshing ending. Genji Japanese Restaurant’s new menu offers more than just the above. Gourmands may want to check out other signature dishes like Tai Kabuto Nabe, Toriniku Katsu Curry Rice, Dobin Mushi and more. There is also the famous Omakase Kaiseki, a set menu featuring Chef Richard’s culinary skills at its best with the fresh ingredient selection of the day. Genji stays true to its origin, the quality is just as good as I had remembered previously. For reservations or inquiries, please contact Genji Japanese Restaurant at 03-7955 9122 extn. 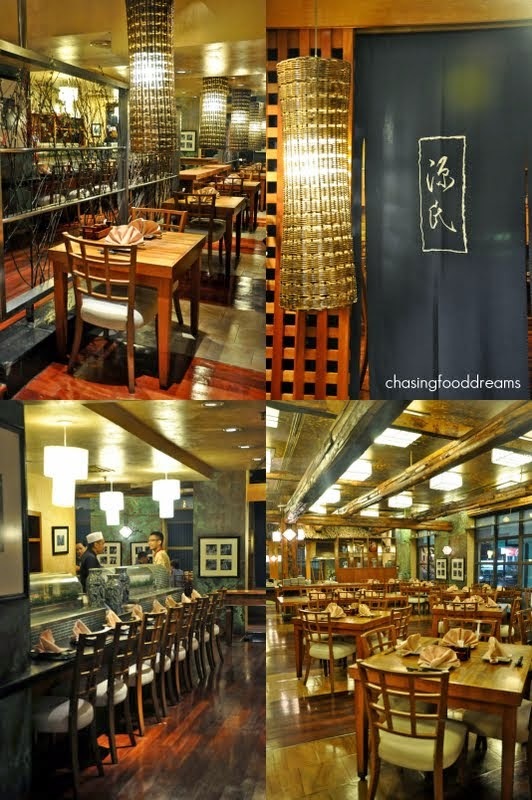 4071 or visit Hilton Petaling Jaya’s F&B blog, www.ZestPJ.com for the latest F&B and entertainment promotions. *Reservation of one day in advance for group dining is advisable. Business must be good - lots of tables all around, they seem to be expecting quite a crowd. Love their presentation, can't wait to have a bite on that dessert! Gorgeous shots as always Jen! Ahhh...I miss Japanese food! Esp. sashimi! Everything look so tempting and colorful in this post. A Buddha's pose can be a symbol of protection, meditation or contemplation, adoration, compassion, expelling negativity, self-confidence, teaching, cosmic order, or supreme enlightenment.